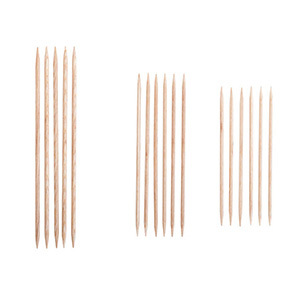 Add a spark to your small circumference knitting with Radiant Interchangeable Short Needle Tips! The bright, bold and warm rays of our newest needle colorway are an incandescent array of red, orange, yellow, and purple, contrasted with dramatic black cables. Radiant Short Tips boast the same strong, smooth layers of laminated birch and sharp, gradually tapered tips that you know and love. The burnished surface delivers just the right amount of grip to easily manage slippery yarns while warming quickly in your hands for hours of comfortable knitting. Available in US sizes 4-10. Set of two. Love these!!! Great for working with smaller item space! I've grown to love knitting gloves. And, my preferred method of knitting in the round is two sets of circular needles (not a fan of magic loop, nor DPNs). I just recently treated myself to two sets of these shorter tips plus two of the 16 inch cables. They arrived earlier today, along with 2 balls of Andean Treasure sport-weight yarn (which is yummy! ), and I've started a pair of gloves. These shorter needles and the shorter cables are a godsend for smaller items knit in the round! I had no idea how awkward the longer sets were for knitting gloves (especially when it's time for fingers) until I replaced them with the shorter sets. Fabulous! I'll definitely be ordering more in additional sizes. Thank you, Knitpicks!